In Judaism, every act large and small receives a blessing of some variety, and the simple act of eating bread is among these recipients. In this, we find the hamotzi blessing over bread. The hamotzi (המוציא) blessing translates from the Hebrew literally as "who brings forth" and is what Jews use to refer to the prayer made over bread in Judaism. It is actually part of a longer blessing which you will find below. It came to pass on the sixth day that they gathered a double portion of bread, two omers for [each] one, and all the princes of the community came and reported [it] to Moses. So he said to them, That is what the Lord spoke, Tomorrow is a rest day, a holy Sabbath to the Lord. Bake whatever you wish to bake, and cook whatever you wish to cook, and all the rest leave over to keep until morning. Six days you shall gather it, but on the seventh day [which is the] Sabbath on it there will be none. So they left it over until morning, as Moses had commanded, and it did not become putrid, and not a worm was in it. And Moses said, Eat it today, for today is a Sabbath to the Lord; today you will not find it in the field. From here the ha'motzi blessing arose as an homage to God's kindness and promise to provide sustenance to the Israelites. The kiddush blessing is recited, then everyone washes al netilyat yadayim, and then hamotzi is recited. Everyone washes their hand using a vessel or cup known as a negel vasser (Yiddish for "nail water") or al netilyat yadayim cup, making the appropriate al netilyat yadayim blessing. Once everyone is seated at the table, the leader (individual reciting the blessing) keeps everyone in mind so that they can be yotzei to the blessing in order that everyone at the table doesn't have to recite the blessing individually. Yotzei essentially means that one's religious obligation is fulfilled by the act of another (the same scenario applies on Shabbat or a Jewish holiday when the head of the table recites kiddush over wine on behalf of the attendees). After the prayer, everyone responds "amen" and waits for a piece of bread to be passed to them to fulfill the blessing. It's common not to speak between the blessing and the actual eating of the bread, because theoretically there should be no break between any blessing and the act that it refers to (e.g., if you say a blessing over a piece of cake, make sure you can eat the cake right away and that you don't have to wait to cut it or serve it). There are several optional actions and traditions that can pepper the Shabbat hamotzi ritual, too. Some will uncover the two loaves of bread and use a knife to slightly graze one of the loaves. One reason for this is that, mystically speaking, it is like marking God's name on the bread. 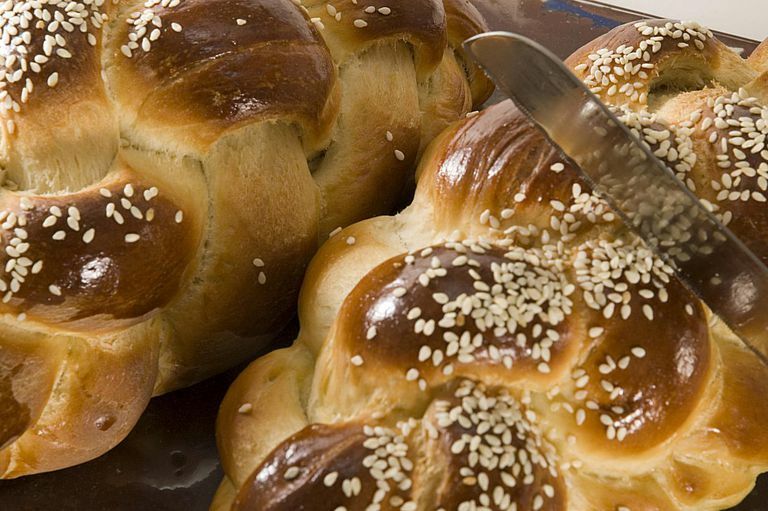 Another reason is that Jews try to minimize the length of time between making a blessing and eating, but when you need the loaves to be whole to make the hamotzi blessing on Shabbat. The compromise is to make a little cut to hasten the actual slicing of the bread after you make the blessing. Some will leave the challah cover on top of the loaves while reciting the blessing, while others remove the cover in order to make the blessing. In some communities, when the name of God (Adonai) is recited, the loaves are actually lifted higher. Some will slice the loaf with a special knife before distributing to the meal's attendees while others will pull apart the challah and pass around the table, while others still will throw the pieces to the meal attendees. Those who oppose tearing refer to the fact that when one is in mourning it's traditional to tear or rip a piece of one's clothing, and on Shabbat we're not in mourning so tearing the challah is, well, inappropriate. In some Jewish communities it is common to only consume bread prior to the main meal on Shabbat and festive occasions like weddings or a brit milah (circumcision), while in other communities any meal of the week might include this blessing, whether a bagel at breakfast or a ciabatta roll at dinner. Although there are extensive laws regarding how much bread one is required to eat to recite the Birkat ha'Mazon prayer after eating bread with a meal as well as how much bread one must eat to be required to wash one's hands and recite the al netilyat yadayim (Hebrew for "washing of the hands") prayer, it is generally accepted that you must recite the hamotzi prayer prior to eating any amount of bread. Baruch atah Adonay Eloheinu Melech ha'Olam borey mieney mezonot. Blessed are you Lord our God, King of the Universe, who has created a variety of sustenance. Jewish Customs of Spelling "God"